PlaneFinder 2.0 is Working! 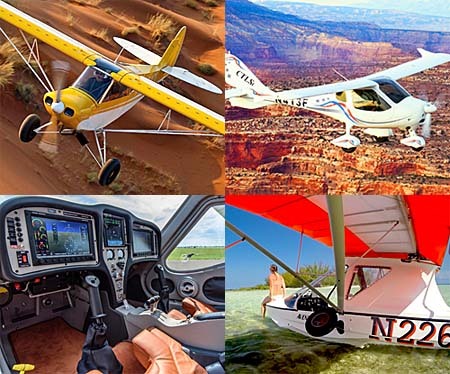 Find the Best Light-Sport Aircraft for You. The question turns out to be impossible to answer. It is something like asking me, “Which color car is best?” The answer depends on what you want. What I like is nearly meaningless unless your desires are almost identical to mine …and that’s very unlikely. If we spoke long enough at an airshow, perhaps I could learn enough about you — your experience, your home location, your expected use of an aircraft, your spending budget, and much more — such that I might advise you what might work for you. I would rarely have that much time and even if I did, I only answered the question for one person. That is a definition of inefficient. Thus came PlaneFinder. Version 1.0 was a series of three articles for EAA Sport Pilot magazine (since discontinued as a publication). The three articles were a lot of work for me, and for readers. At the end, maybe you knew what to buy …but possibly not. It was a worthy first effort, you might agree, but it was not the right solution. So, PlaneFinder 2.0 followed. In PF2, I created 25 categories that describe aircraft. 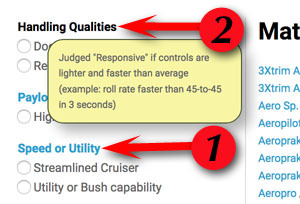 For each category, you pick a response that works best for you, for example, do you prefer high wing or low wing? All categories were simple, mostly this-or-that answers. With PF2, I tried to make it very user friendly. If you answer enough categories, the result is you will limit the number of aircraft that match that description. You don’t need to answer all 25 categories. In fact, after you address 5-8 of them, the list will be far shorter, maybe just a handful of aircraft models. The trick is not picking the best airplane for you. It is eliminating those of lesser interest. As famed fictional detective Sherlock Holmes might say, what you are left with is the solution. (1) Read more instructions if you are new to PlaneFinder 2.0. ••• (2) Pick any category and mark your preference by clicking the radio button; if you change your mind, an “Ignore” button appears to let you uncheck. 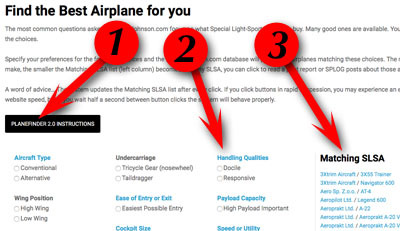 ••• (3) See the “Matching SLSA” list for aircraft that meet that choice. Start from scratch by clicking the “Reset the Form” button at the bottom of the page. Each time you answer one category, the list shortens. Using the high wing/low wing example, you can see that many aircraft will be eliminated. A single aircraft make and model cannot be both. Then answer your choice of seating, side by side or tandem. The list shortens. In a brief time, you are left with a much shorter list and from that you may be able to find a few aircraft you need to investigate more fully. Click on a link for that aircraft to read what I’ve written about it or a video covering that model. PF2 is a lively feature. The “Matching SLSA” list changes dynamically. It can actually be entertaining to click on or off categories to see what remains. Even pilots that are not shopping can enjoy playing with PlaneFinder 2.0. The source of the information is my evaluation of every aircraft on the SLSA List in all 25 categories, which is almost 3,600 data points. Since most questions are clear choices, any bias I have tends not to show …after all, an aircraft is either a high wing design or it is not. Only a few categories are more subjective. (1) Hoverover with a mouse, or tap on a device to (2) Read a description of what the category means — most but not all are so described. One category that is devilishly hard is Price Range. This is not hard to understand. What is the price of a Ford F150 pickup truck? Doesn’t it depend on which of dozens of options you choose? An airplane is no different. Plus, prices change based on currency exchange rates and as manufacturing component costs change. So, after we moved the older ByDanJohnson.com website (BDJ1) to a new, modern website (BDJ2) that works on smartphones, tablets, and computers, it took some time to make all the details function across all platforms. My webmaster has done a terrific job and PlaneFinder 2.0 is now available for your buying education …or just for fun. Use it however you want. To access, we ask only for your name and email address. Like most of ByDanJohnson.com PlaneFinder 2.0 is completely free. ENJOY! Rumor had it the new Raven s-20 would have a folding wing option. Do you know the status? Steve: Your best bet is to check with the source, Rans Aircraft. You can find their contact info here. I know is not their purpose, but what LSA /SLSA is better for handling cargo? For running a small shipping business to remote regions? It is possible Special LSA may be allowed to do some kinds of aerial work in the future, but today any commercial activity other than flight instruction and rental is forbidden by regulation. However, to haul your own items, Jabiru’s J-230 has an especially spacious cabin as does Paradise’s P1NG. Each has a third door for the easiest loading to their aft compartment. Of course (!! ), you must do a weight and balance check before taking off too heavily loaded. Thanks a lot Dan. I’ll definitely take a look on them.